Dr. Ryan G. Manecke, (urology), was recently honored by Presence Saint Joseph Medical Center (PSJMC) as the 2017 “Physician of the Year” during the hospital’s Physician Recognition Night. The award recognizes and celebrates outstanding physicians who embody professionalism, teamwork, clinical excellence and a commitment to personal growth. Manecke earned his medical degree from the University of Kansas School of Medicine in Kansas City, Kansas. He performed his internship and general surgical and urology residency at Loyola University Medical Center in Maywood, His residency included 11 months of training in pediatric surgery and pediatric urology at Loyola University Medical Center and Ann & Robert H. Lurie Children’s Hospital of Chicago. Manecke is a member of the Chicago Urologic Society, the American Urologic Association and the American Association of Clinical Urologists. He has participated in research and authored articles and book chapters on the topics of prostate cancer, dysfunction and the surgical treatment of advanced testis cancer. Manecke is certified by the American Board of Urology. 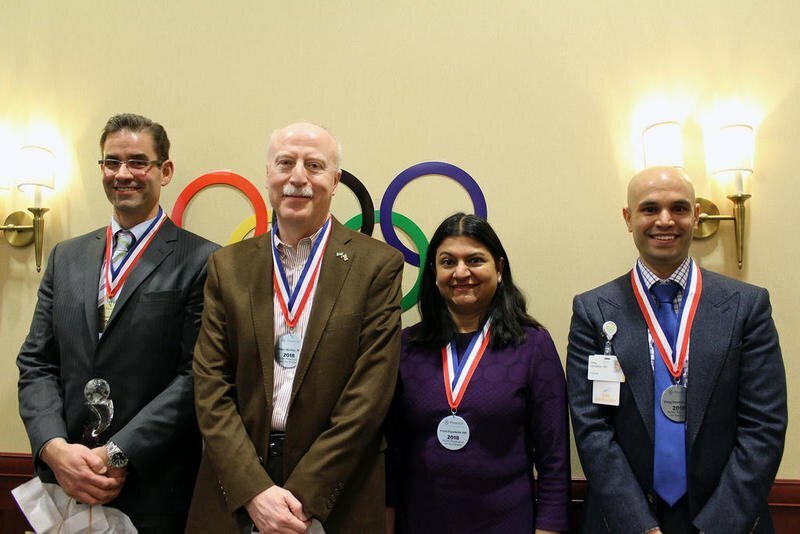 PSJMC also recognized their finalists Dr, Maen Martini, MD, (anesthesiology and pain medicine); Dr. Preeti Nagarkatte (internal medicine and nephrology) and Dr. Virag Dandekar (radiation oncology). Physicians who retired in 2017 and those with significant milestones of service to PSJMC were also honored and thanked for serving as a true model of excellence in the delivery of health care. The following doctors were also recognized for their service anniversaries. Twenty-five years: Dr. Kwabena Boateng, Dr. Aristides De La Hera, Dr. John Grieco, Dr. Ronald Hayes, Dr. Mickey Jester, Dr. Matthew Kelleher, Dr. R.K. Natesh, Dr. Ada Paolucci, Dr. Jill Patterson, Dr. Gustavo Pedraza, Dr. Philip Serna, Dr. Kulumani Sivarajan and Dr. Peter Stockmal. Fifteen years: Dr. Saba Ahmed, Dr. Maimoona Aijaz, Dr. Farhana Alvi, Dr. Jonette Belicena, Dr. Gregory Bezanis, Dr. Cristina Camara, Dr. Samiullah Choudry, Dr. Sung Chung, Dr. Michael DeMaertelaere, Dr. Aileen Donausky, Dr. William Farrell, Dr. Dan Garganera, Dr. Visvanatha Giri, Dr. John Scott Groch, Dr. Zlatko Haveric, Dr. Ashraf Iskander, Dr. M. Ammar Katerji, Dr. Anjali Kher, Dr. Srinivas Kota, Dr. Muawia Martini, Dr. Bryan Phillips, Dr. Robert Semba, Dr. Usha Setlur, Dr. Paramjit Sikand, Dr. Shilpa Thakkar, Dr. Karim Tourk, Dr. Paulette Trum, Dr. Jonathan Wu Dr. and Andrew Wunderlich.